The British attack had stalled at the entrance to the village of Fontenay. Attackers were taking a breather and requested artillery to pound the line of defence, while reinforcements were supposed to attack the village from the flank, too. Lt Trails' platoon had been badly mauled earlier during the day, but he had requested reinforcements and was close to full strength again - only corporal Findlay was still at the regimental aid post with some of his men. Meanwhile the meager Hitler Jugend forces were reinforced by a full squad of landsers and medium tanks, the plan being to commit these forces to a counter attack as soon as heavy artillery barrage would lift. Situation was the same as previously, with game starting from same JoPs. From the get go, the barrage made sure any German deployment was hard, let alone a coordinated attack, so much for the plan. First Germans deploy - artillery craters mark the previously identified German positions which have received extra love from the attacker. But this time the barrage was far more savage than before. 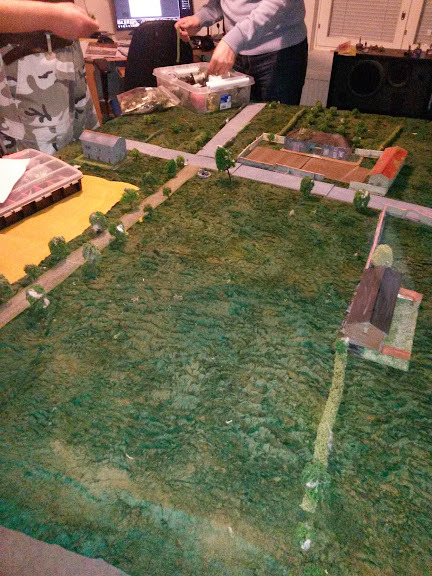 Egger's 3rd section was able to deploy to the central farm house, but rest of the German forces were missing. 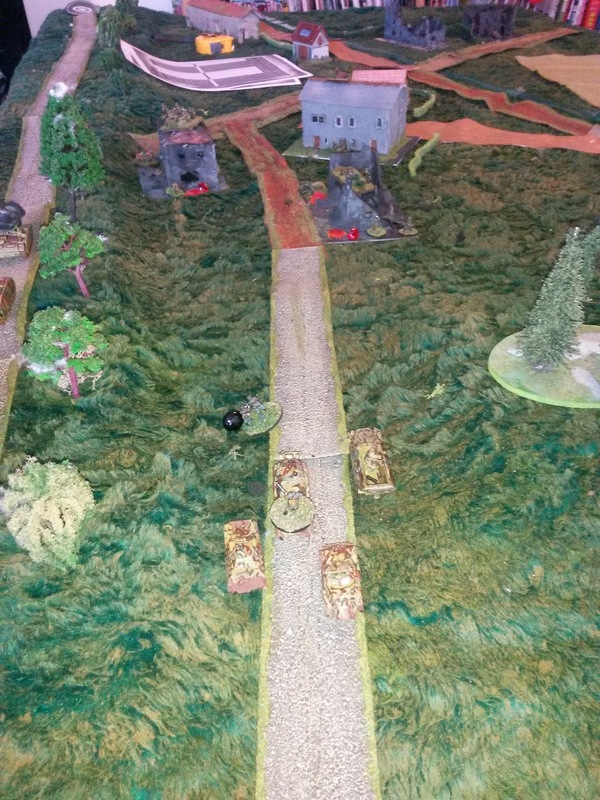 The attacker deployed most of his infantry forces for a push through the center, while Shermans kept pounding the farm where Egger's men where located. Still no engineers to clear obstacles. 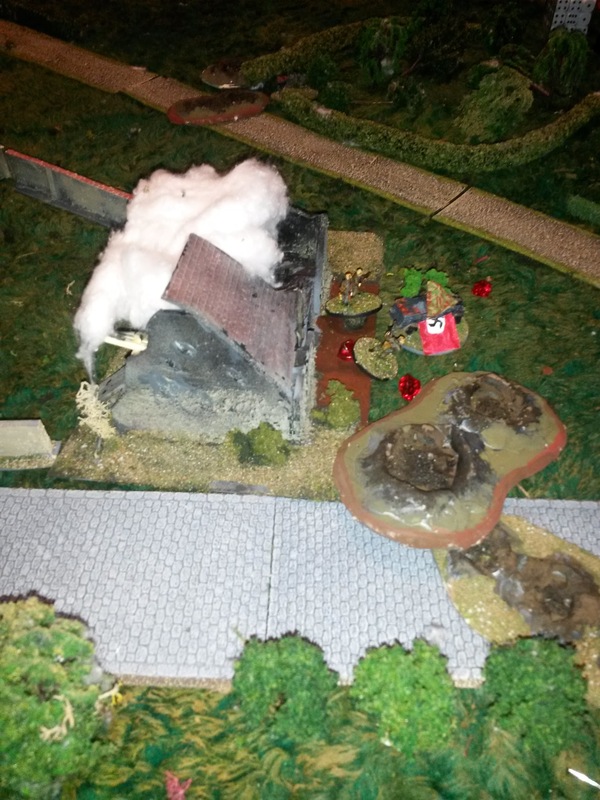 It took several volleys of 75mm HE, but finally the building collapsed, forcing the remains of Egger's squad out. Path through ms Ediths raspberries have been cleared and Trails was ready to signal a general advance. Shermans gunned their motors and advanced, tommies cheered and prepared to follow. And then a great boom was heard, with the tank platoon's HQ Firefly exploding in a great ball of fire - an off board heavy anti-tank gun had opened fire from the general direction of St Aubin's bridge, other side of the river where ground was rising. 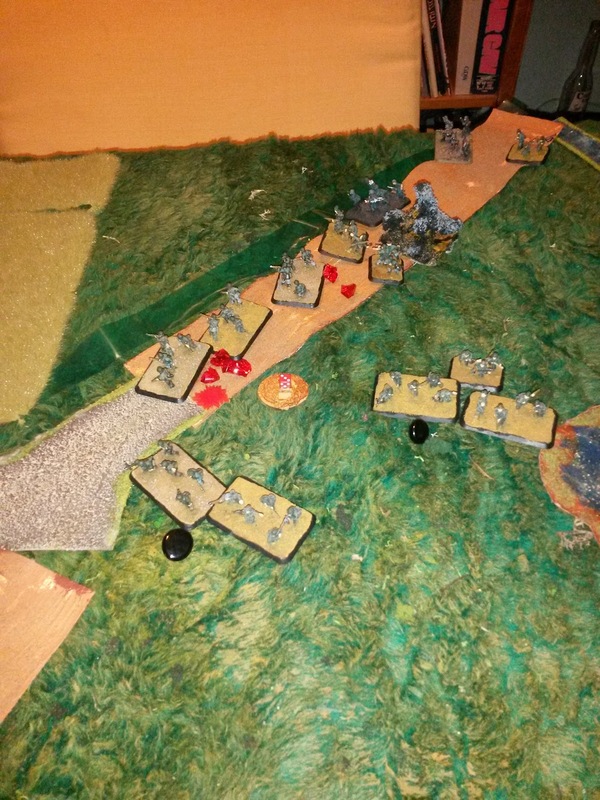 (game was 2 platoons vs 1 German platoon, so defender had a off board 88 which could fire with a CoC die. First and only shot during the game was a critical hit to the side of the turret.) 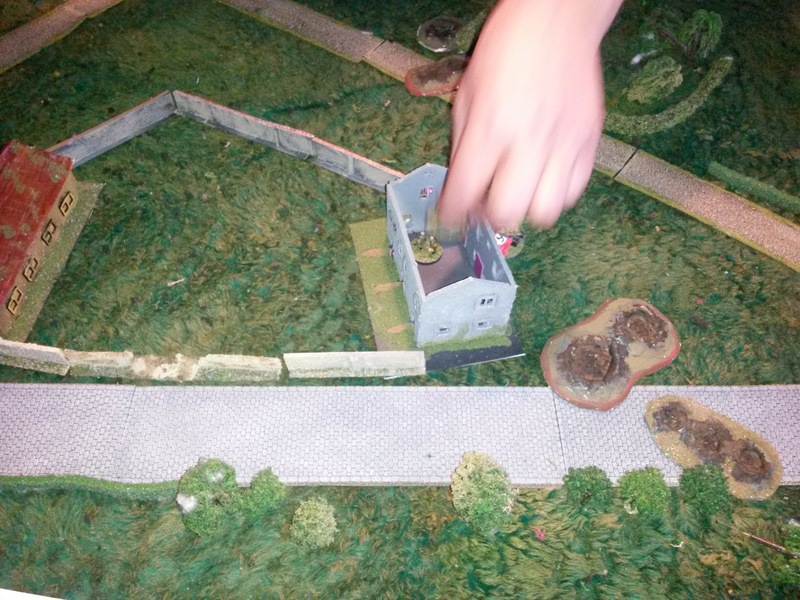 And to add to the insult, a German PzIV emerged from cover and nailed the leading Sherman with one shot - so much for a perfect hull down position behing the stone wall. Remaining Sherman returned fire, but repeated hits to PzIV's weak turret armor failed to do much anything. At this point, Trails halted the attack an signaled for the mortar forward observer to get some artllery to cover his flank. A mad moment, 2 tanks go ka-boom! Several tommies get injured from shrapnel. Spotting round fell and German tanks duly switched to the other flank, after the remaining Sherman disappeared behind smoke. Trails had 2 PIATs in support and soon both of them were hammering the leading PzIV - several hits and no effect, while return fire soon routed one of the brave PIATs. This far in the campaign, PzIVs have suffered 16 hits from Fireflys, PIATs and 75mm Shermans. Net result is one broken road wheel, 1 slightly misaligned gun sight, impressive scratches and one dead gunner. It looks like the German armor is living a charmed life. After several tries, FO finally sees the spotting round. Scharfuhrer Fuchs earns yet another medal, another notch to the tank assault badge. June 25th, 1944, the morning mist has disappeared and the British forces are finally continuing the attack after assembling their dispersed companies. German resistance has been much stronger that intel indicated, so all point companies are advancing behind a creeping barrage. Lt Trails' platoon has finally reached the outskirts of Fontenay, hounding the withdrawing enemy. And then the scouts bring info that enemy has stopped and is again offering resistance. Sounds of heavy tanks, Tigers perhaps, have been reported from the front, so a platoon from 24th Lancers has been attached. Oberscharführer Maurer on the other hand has received orders to act as a wave breaker to prevent a rout - rest of the company is withdrawing to the main line, while he is conducting a delaying battle supported by a small outpost manned by a hmg42 and PaK40 AT-gun. 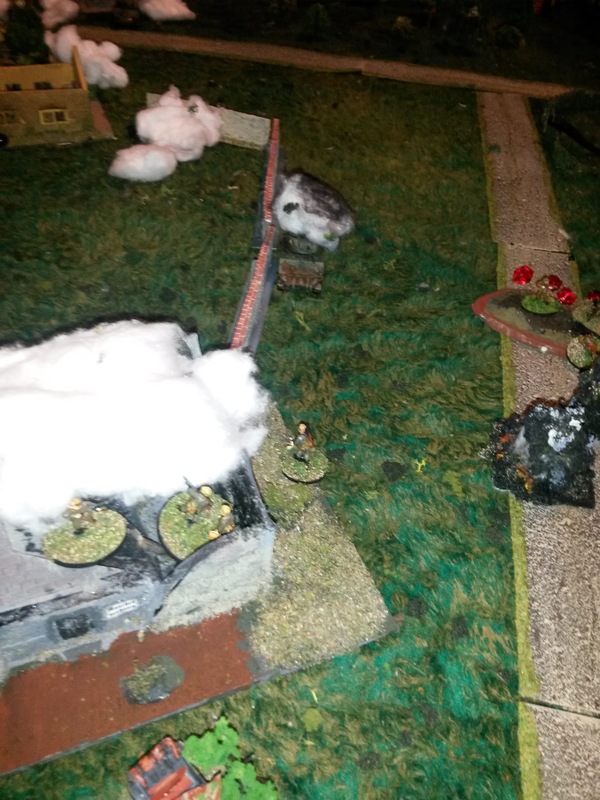 Both the SS section leader Egger and corporal Findlay from Brits are back from aid station with heavily depleted squads, having dragged themselves away from the carnage of the previous game. The picture shows JoPs and overall plans. The attacker (red) decided to advance through the covered center while tanks would cover the open line. The German defender dug in around the crossroad and the main house, betting on the fact that attacker would not have artillery. A good guess. 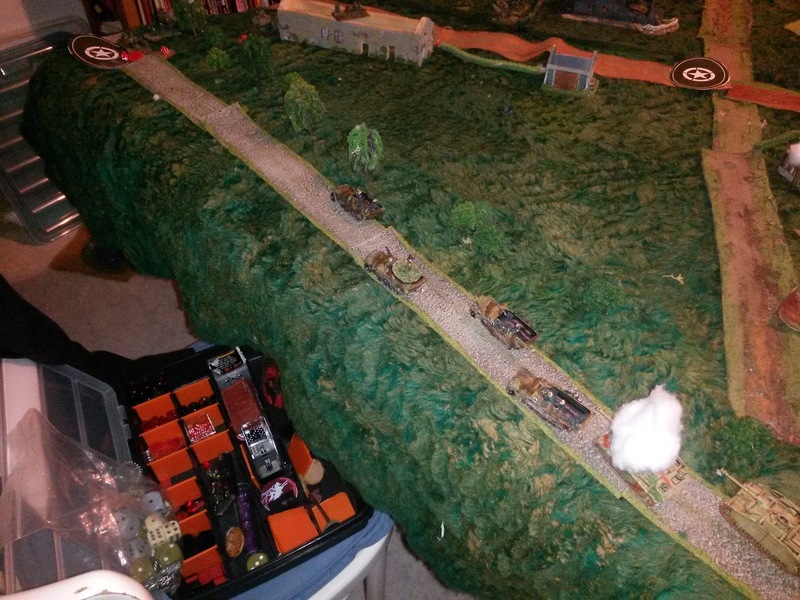 First Sherman of 24th covered the open right flank, only to get engaged by a PaK hidden at the crossroads - shots over hedges were not the easiest ones, but the duel was easily won by the gun. 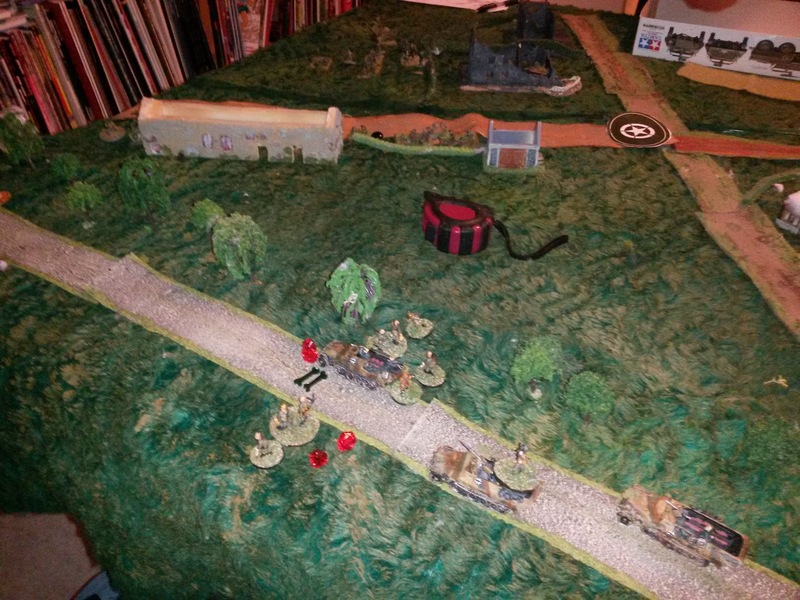 First shot killed the radio/bow gunner dropping the tank out of the radio network and when tank's smoke grenade failed to block line of sight, next shot wounded the tank commander panicking him. Tank was soon after abandoned. This surprise forced the attacker to switch to the other flank, while 2" mortar smoked both the PaK and central house to oblivion. This presented the defender with a nasty dilemma. His AT capability on the new threatened flank was resting on infantry portable rockets and British tanks were staying well away, shelling the position wrong relative safety, while the British infantry was massing for attack. If that attack got through, a JoP would be lost and the whole position compromised. And the attacker seemed to be in no hurry, happily shelling poor landsers, while Trails was fighting his private battle against the garden bushes. So the defending HJ did the only thing possible and launched an attack on the other flank to threaten the British JoP and to draw away forces threatening his position. This worked to a degree, but Friedmann's PzIV attracted the attention of both remaining Sherman (Firefly was well hidden, looking for a moment to pounce) and a brave PIAT team - these were so separate that poor panzer would always present weaker flank to at least one attacker. Fortunately panzer also seemed to lead a charmed life, as several shots bounced away from the thin side armor without causing even shock. Finally hunted hunter burst through the farm wall and completely surprised the British infantry that was massing for an attack against the HJ strong point. British tanks were on the wrong side of the wall, PIAT was way back at JoP (and out of CoC die) Germans had a CoC die to interrupt any attack over the open ground or through the walls. 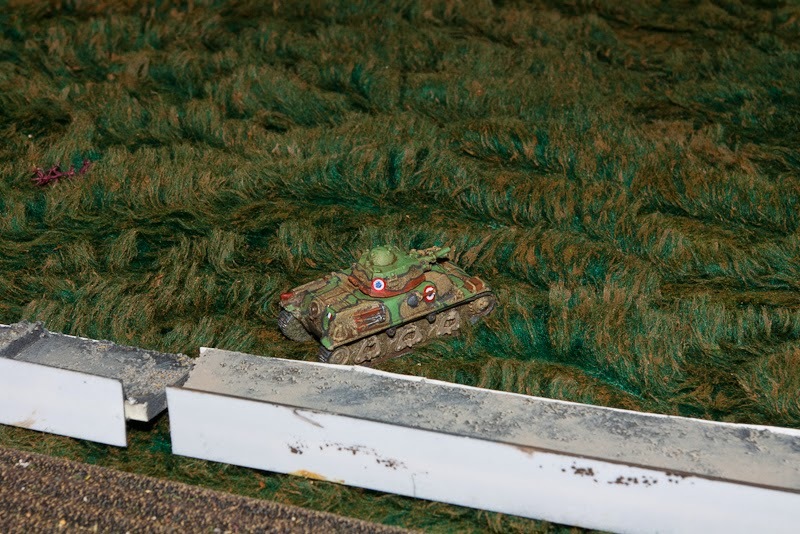 It did not look too good for lt Trails, so he decided to charge past the tank, trusting that his superiority in men was so big that HJ would fall even if he lost some men to the tank. Shermans turned to shell the strong point once more and command to attack with fixed bayonets was given. Friedmann had no time to react to the infantry surging pass and the lone lmg guarding the inner yard failed to fell too many of the attacker - 20 Brits with 4 leaders (SL+3JL) against 6 Germans with 2 leaders (SL+JL) did not look too good for the defender. Of course, having 2 machine guns and 2 machine pistols guarding a heavy building is quite a force, as the attacker found out. 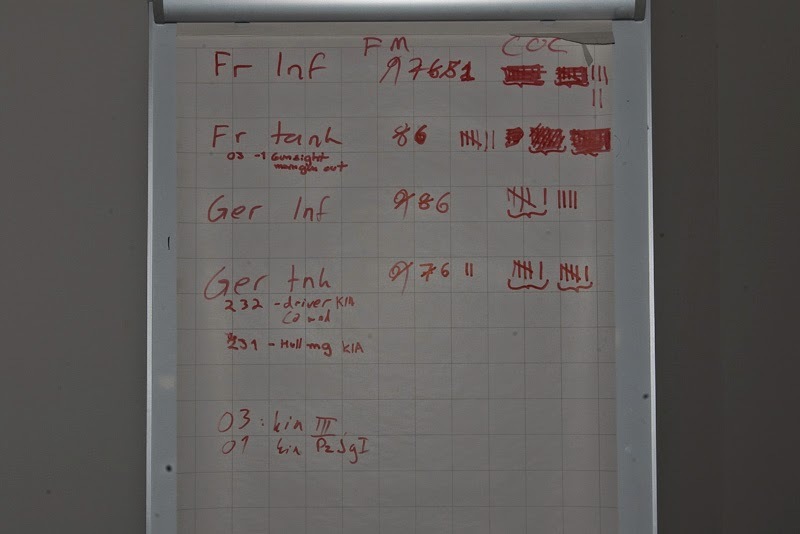 Germans inflicted whopping 25 kills vs 10+ by the attacker, so both side were wiped out to a man. Wounded attackers later crawling out from the mess told how the last standing German youths just detonated bundles of grenades to bring down the house on everyone. At this point the British infantry platoon was way below 0 morale, so the non-deployed section withdrew. And their losses also mean that the supporting tank platoon dropped to 0 and withdrew - mauled and surprised HJ were left holding the field. Next game will show how much of a pyrrhic victory this was, as HJ has very little capacity for soaking losses. GM diced for all the leaders and Brits managed to get 2 leaders (SL Trails and JL Findlay) out of the mess wounded, with one wounded man following. Rest were either killed or taken prisoner. German (support) SL was killed with section leader survived with light wounds. Start of the game, with positions of Jump off Points. The British attack started with a barrage hammering the Hitler Jugend position - as soon as it was lifted, the point platoons went forward. Unfortunately for them, fog was thick as soup and quite a few men and vehicles got lost. The British second section was commited via their bottom JoP to open up a potential avenua of attack hugging the wall - HJ immediately countered by deploying a section to the same flank, effectively shutting it down before armor could be committed. The topmost British JoP was quite close to the building by the crossroads (which also harbored a bunker, unknown to the attacker), so he made a gamble and pushed 1st section towards the building at running speed. Unfortunately the dice were not with him and he failed to reach the building or to shut down the JoP behind. 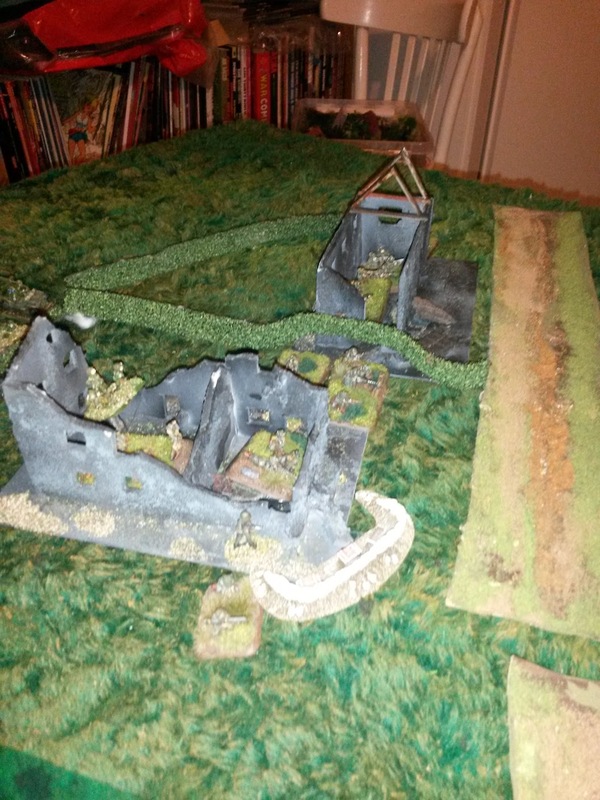 Germans immediately deployed another section, which cut down half of the attacking section immediately. The M4 Sherman committed to oust them with fire reported that he was somewhere in the fog, unable to see or hear anything. At this point, Lady Fortuna switched to the British side. He deployed a Firefly which promptly set the house with bunker on fire and wounded the section leader inside. (GM completely forgot that Firefly has HE only after September 1944. That single experiemental HE grenade was very useful) Then the deploying German PzIV failed to hit the Firefly and took a hit to track as a return gift. Defender wisely decided not to continue a lopsided gambit but withdrew back offtable. Bunker was open, 1st British section had almost recovered from the disaster, German section was leaderless and life looked rosy. High point of the attack. Until Germans committed their reserve team. A sharp counterattack by 5 men threw the British 2nd section back in close combat, routed them and then withdrew back to safety before anyone could react. (3 phases in row just in the right place!) 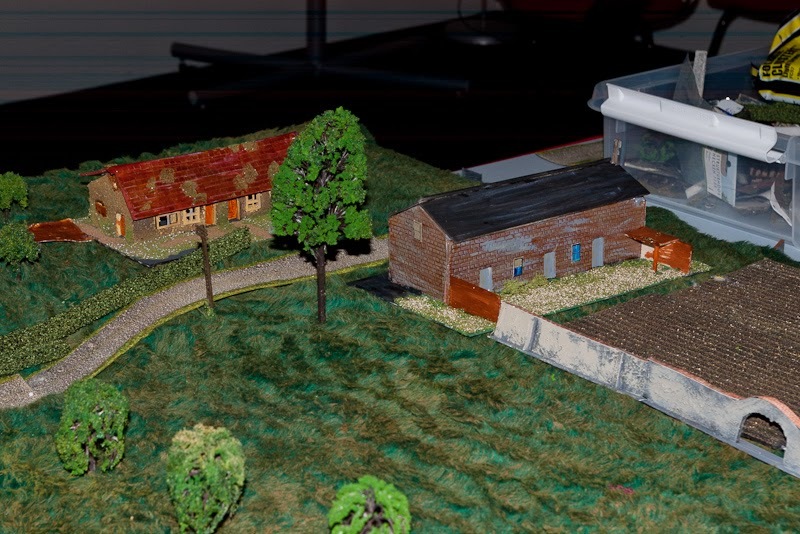 Germans still have quite a bit of estate to conduct a delaying action and tanks would be needed in close support to crack the walls of the farmstead. So the attacker took the safer option and withdrew to take a breather and call in more reserves, as the AT capability of Germans was a question mark. All in all, relatively bloodless game. The Brits suffered half a section in casualties, while Germans had one lightly wounded NCO and one wounded. The boys of HJ are proud of their leader, while the attacker's morale was kept up by a rumour stating that 1st section leader was to be mentioned in despatches for his brave attack at the bunker. Next game will see the Brits attacking the same position after a short breather. Hopefully the fog has cleared by then. A what if scenario of Market Garden during 22.9. In reality the German KG's attacked the Club Route (allied main spear head/supply line towards Frost's paras) piece-meal and never cut the road permanently. Several attempts were made at the Veghel bridges, both by KG Walther from east and KG Huber from northwest. This is a what-if of the situation where these KGs actually managed to co-ordinate the attacks so that the KG Huber stopped reinforcements from west, while KG Walther makes a 2 pronged attack at Veghel - SS KG Richter from northeast and Grenadier Regiment 16 along the canal, with the final aim of capturing and blowing up the road bridge over the canal. Sorry for the quality pf the pictures, forgot to charge batteries for a real camera. See map of the general area. 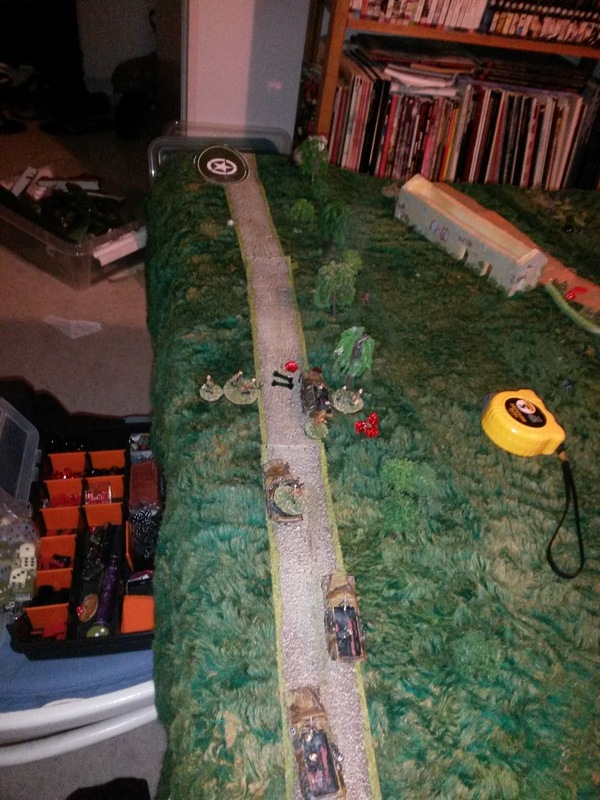 501 PIR along with other 101st AB units have been tasked with capturing and holding the Club Route highway. 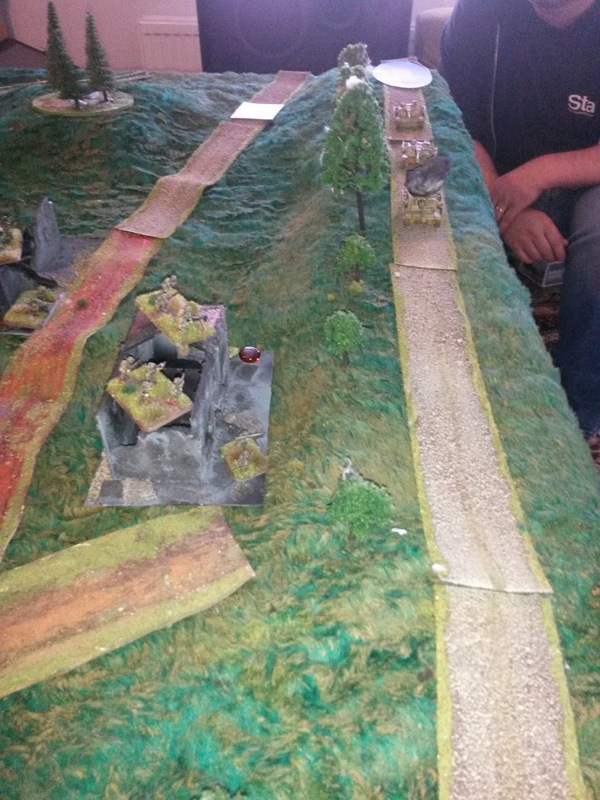 2nd battalion is holding the Veghel bridges and Uden highway. 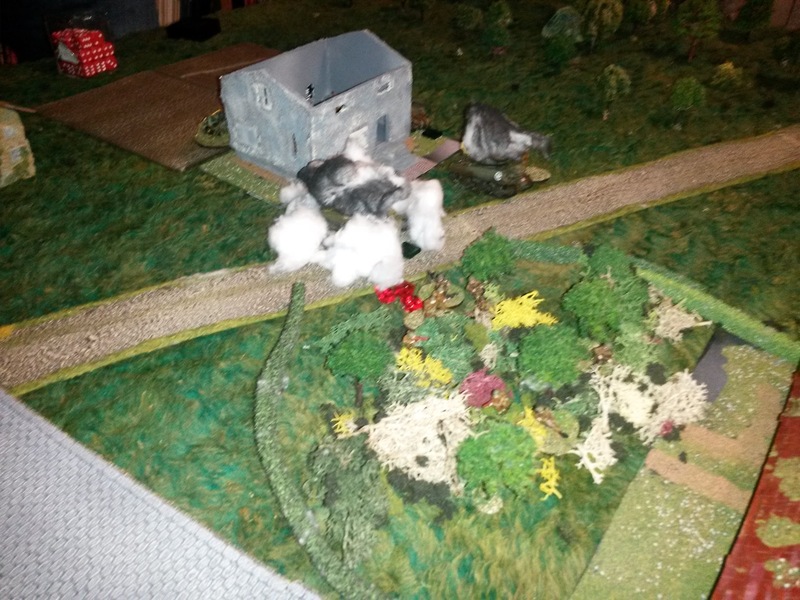 Dog coy is holding the road bridge and Aa canal approach, while Easy and Fox are covering rest of the village. Rest of the 501 has been engaged in limited offensives near Schindjel. 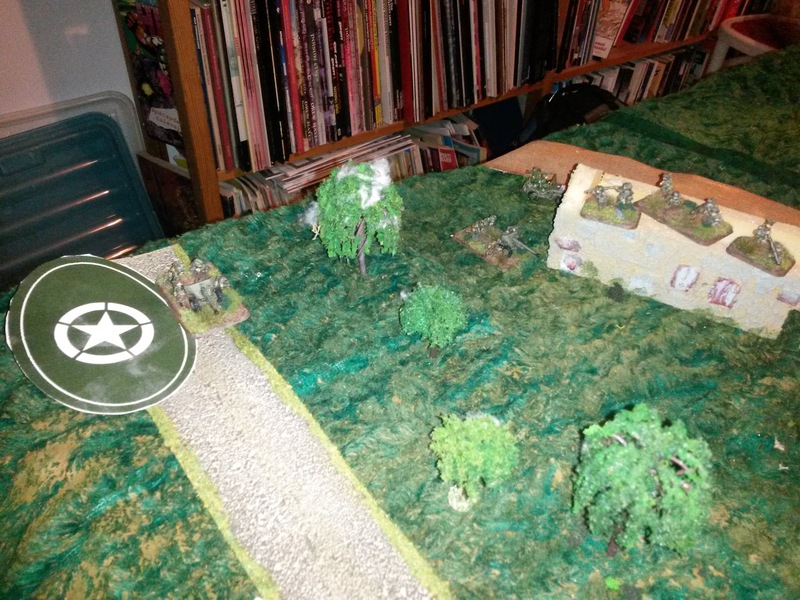 Colonel Sink's 506th PIR has been dispatched to area, but has been delayed by another attack. Enemy is currently attacking Veghel from northeast with strong armored forces and despite communications having been cut, sounds of heavy fighting and tanks can be heard from the west side of Aa canal. 1 platoon of Dog coy has been attached to LC Ballard's battalion reserves and is now engaged in heavy fighting north of your position. As the patrols report large enemy tank formations (both tanks and self propelled guns) approaching, a platoon of pioneers and light AA have been assigned to bolster your sector. You will be supported by 81mm mortal battery firing from Veghel. Troops are well trained and highly motivated, with a strong core of veterans. Bad weather has grounded planes, most of heavy artillery is currently on the move and out of our radio network. There is a probability of enemy air force making appearance. You are to hold the approaches to road bridge (3) and Veghel at all costs, there is nowhere to withdraw. Strong reserves are sent to you, but they are now bogged down in fighting enemy, ETA unknown. Enemy composition is unknown, at least Panthers and SPGs on Panther hull have been reported (latter being almost immune to 57mm grenades), in addition to FJ and SS infantry. Enemy is well motivated, but tired, poorly trained and badly supplied. It is unknown whether enemy is attacking along the canal, or from the direction of Havel village. Apart from roads, terrain is passable but not very good for vehicles. During the last days, large number of enemy airborne troops have been deployed along the Nijmegen-Arnhem corridor, with the intent of creating a salient to attack Reich. Enemy is using Arnhem highway to supply the forward troops. Cutting the highway would both halt their attack and allow us to counterattack. You are Hauptman Stross, Grenadier Regiment 16, 1st battalion. 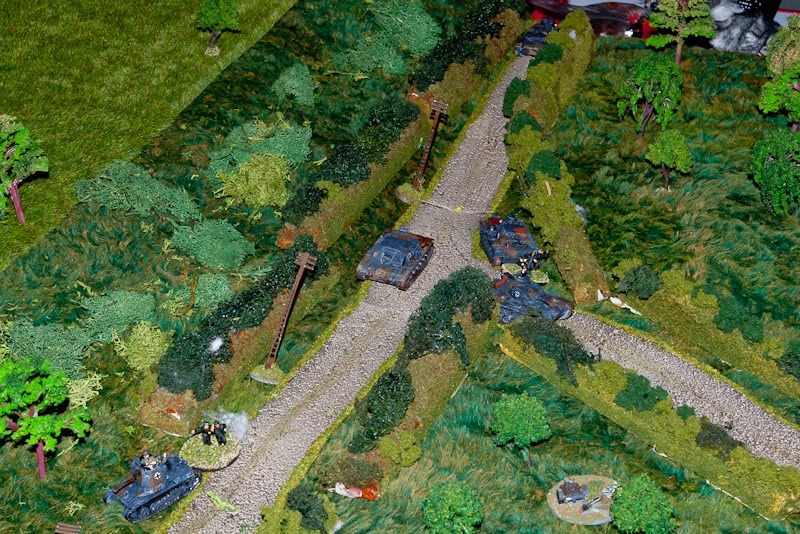 As part of KG Walther, SS KG Richter is attacking on your right towards Veghel along the Erp-Veghel highway (battalion of SS infantry, zug of panthers). You are to provide flank security to KG Richter and to accompany pioneers to the Veghel road bridge (3). Attack will start at 9 AM, with KG Huber on the west side of Veghel launching a simultaneous attack to capture the railway bridge (1). Your attack will jump of from village of Havel, after Erp has been cleared, highway along the Aa canal can also be used for approach. 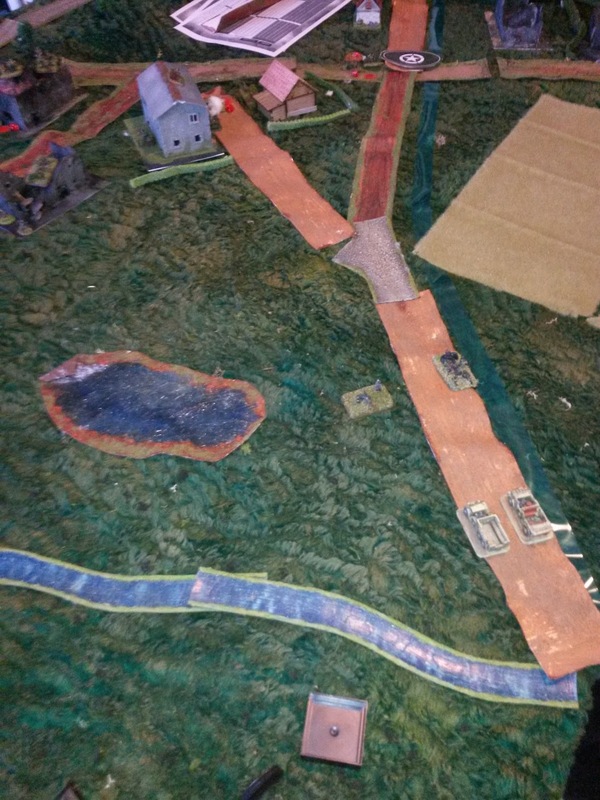 Your main mission is to capture the village of Leest and clear the canal highway up to the bridge so that the 107 PzPioneer company can pass you and demolish the bridge. After that, you are to form defensive screen on the east side of the canal. Weather permitting, Luftwaffe will support the attack. Your main artillery asset will be company 81mm mortar battery in Havel and 105mm Pz Artillery will support you when situation permits. KG Richter main effort will be on your right, capturing the Uden-Veghel road and then attacking Veghel from east-northeast. Enemy units are light airborne troops with very limited heavy weapon support and occasional medium tanks on the highway. Due to bad weather in the west, enemy air force is expected to be unoperational until 12 AM. Troops have been marching and countermarching for last 2 days, so they are dead tired and most of heavy equipment and ammunition are Somewhere Else. Core of your officers and NCOs are experienced, but most of your landsers are just wet behind the ears boys and old men. Terrain outside roads is passable for vehicles, but wheeled vehicles should take care. Germans decided to use the Stugs as "snowploughs" to clear the canal highway, while everything else would make a show of force on the other flank. This would hopefully draw defender to the wrong flank and allow the HT mounted pioneers to reach the road bridge, just outside the table. Paras, on the other hand, were really unsure what they were facing, so deployed in depth, with pioneers as a reserve. Some movement in the horizon. Game started with Germans pushing lots of recon dummies to table, with US snipers quickly identifying these ("Just an old man and bicycle, again"). Next wave of blinds turned out to be something else altogether, witha platoon of Stugs appearing along the canal highway and armored recon cars on the low road alongside them. 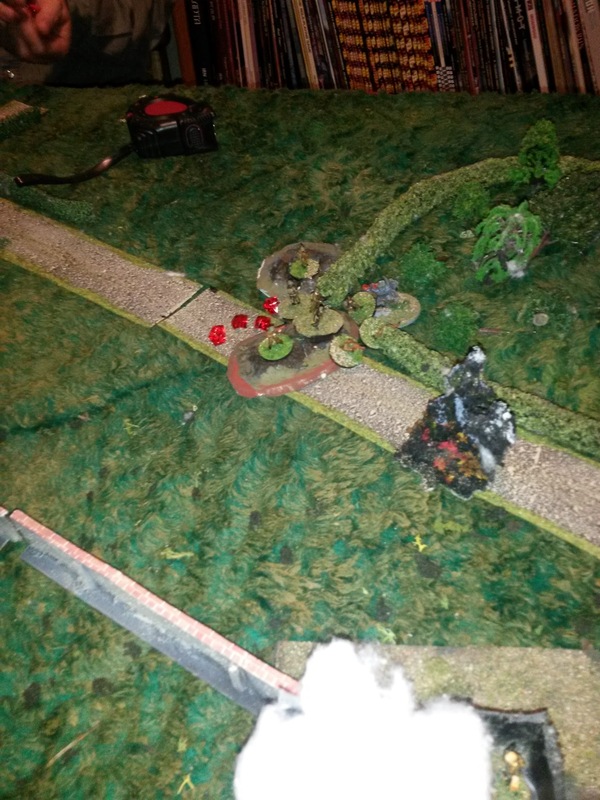 First shot of the game saw the lead Stug go out in flames and second Stug managed to shrug of 3 bazooka shots before the pesky AT team was gunned down. Then began a duel between a brave 57mm atg and the Stugs - Stugs would shrug of a multitude of hits while completely unable to hit the puny gun. Luftwaffe also made an appearance in a form of lone FW - no targets were identified, so pilot continued circling around. First shot of the game. Rest of the shots from the same bazooka team were accurate, but inefficient. 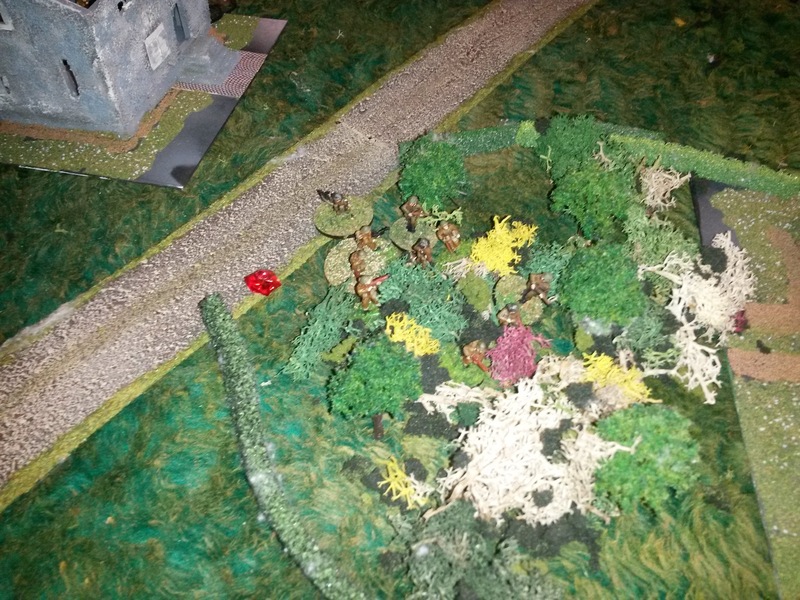 Several minutes passed while Stugs shrugged of hits, the motorcycle team from the German recon platoon continued a very lopsided firefight with a whole para platoon, but by some miracle managed to survive with only one casualty. Germans deployed a lone infantry gun and hmg on their right flank to harry the paras, but these were quickly cut down when 2nd US platoon revealed itself. Very surprising attack on the other flank. A bait for the US paras, maybe? 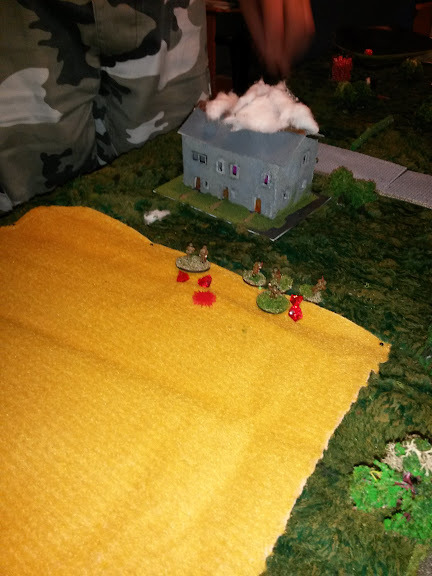 Paras defend a burned out farmsteam, while civilians take cover in the cellar. And artillery joins in. At this point, it looks very bad for Germans. But looks deceive, as everything is going as planned. 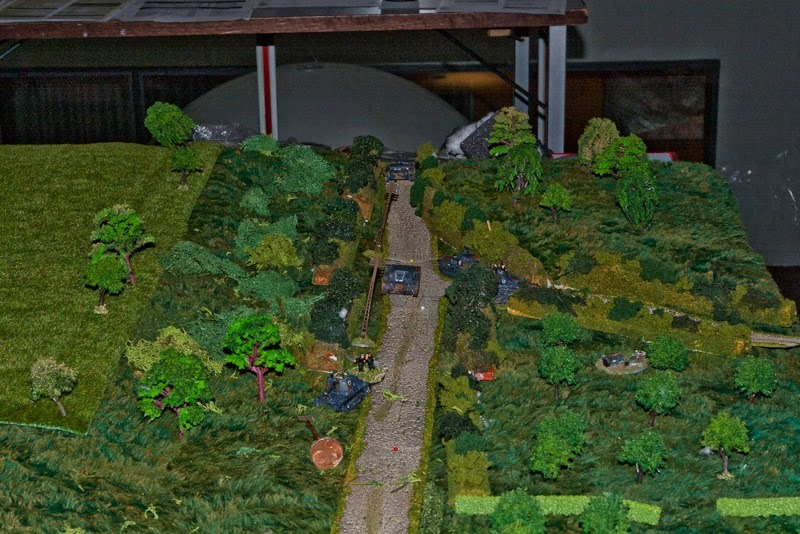 A fierce fight continued alongside the canal road, 57mm kept hammering the leading Stug, which kept killing the bazooka teams that tried to ambush it. After several agonizing minutes, paras had lost half a dozen bazookas, but the leading Stug finally went up in flames. Meanwhile the other US gun had located the recce platoon - what should have been an easy kill turned out quite an equal fight. The leading armoured car managed to survive 3 direct hits without even shock, and the following halftrack (with even less armor) also survived multiple shots. Recon platoon did not get many activations, but finally managed to KO the gun with one light scout car surviving. At this point, the German right flank was bleeding, but had managed to tie down the 2nd para platoon, canal highway was guarded only by the lone atg and US center was open, so para pioneer platoon was committed to plug the gap in the center, just as the Germans have hoped. Panzer pioneers were committed to the highway and started a cavalry charge behind the Stug. US player did see the danger, but moving the pioneers laterally failed, as the Stug and advancing German reserves kept pinning them down. US anti-aircraft machine guns did their best, but were also overwhelmed by the number of targets. 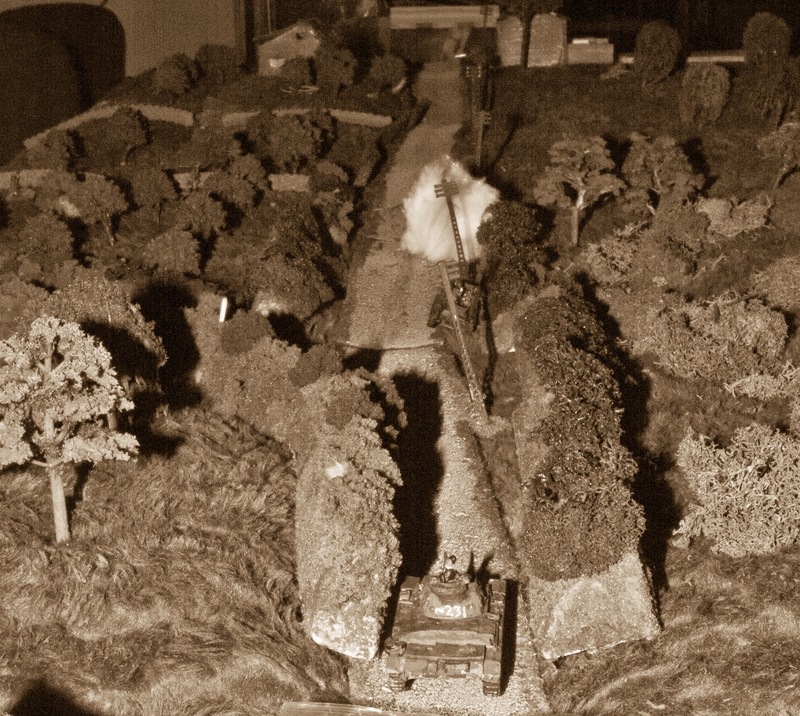 The leading pioneer section got hammered, but in return managed to knock out the 57mm gun and when the command halftrack finished the 0.50" heavy machinegun, US admitted a defeat, as he no longer had units capable of defending the highway, even if his force otherwise has still in fighting condition. Pioneers are committed to the fray. Last US reserves are committed, but is it enough? Turns out it is not enough. There is nothing to stop the armored attack. So Veghel road bridge was blown and Club Route cut for good. Not a good day for allies. Quite successful game overall, even if it showed that we had not played IABSM for some time. US paras had a nice layered defense with reserves (only mistake was defending from the front against tanks), but this was countered with German cunning: Germans used one strong unit to clear the real axis of attack, while most of his troops tied enemy units to a secondary area. A classic feint which worked perfectly. My response to The CoC Challenge. One of the recurring comments about Chain of Command is about the perceived complexity. It is said to be a good set, but so complex that novices should pick something easier. I very much disagree, as for years I have not played something that would have such elegant simplicity as CoC, while retaining the period feel. So, what would be a better way of testing this than subjecting complete newcomers to CoC. This was the premise for our Ropecon demo game with Heikki, my usual partner in crime. 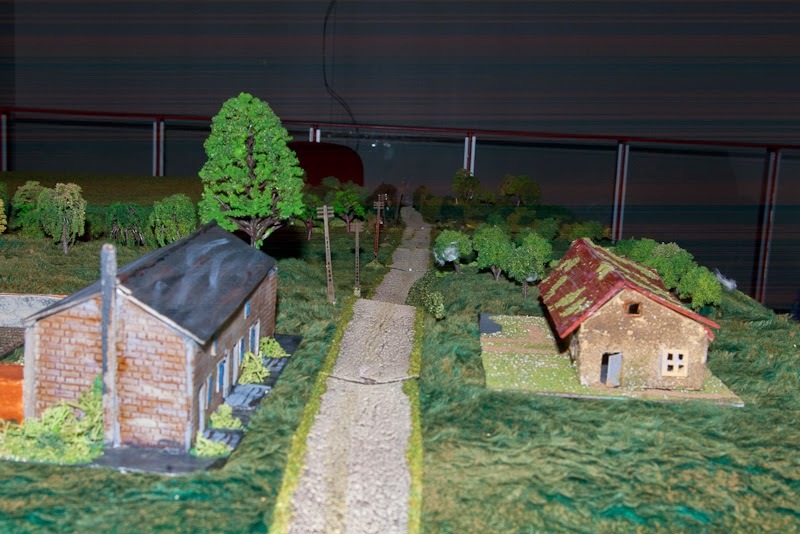 KG von Luck had just been published, so we started planning a Normandy-based game, featuring as many iconic things as we could cram into a small field. 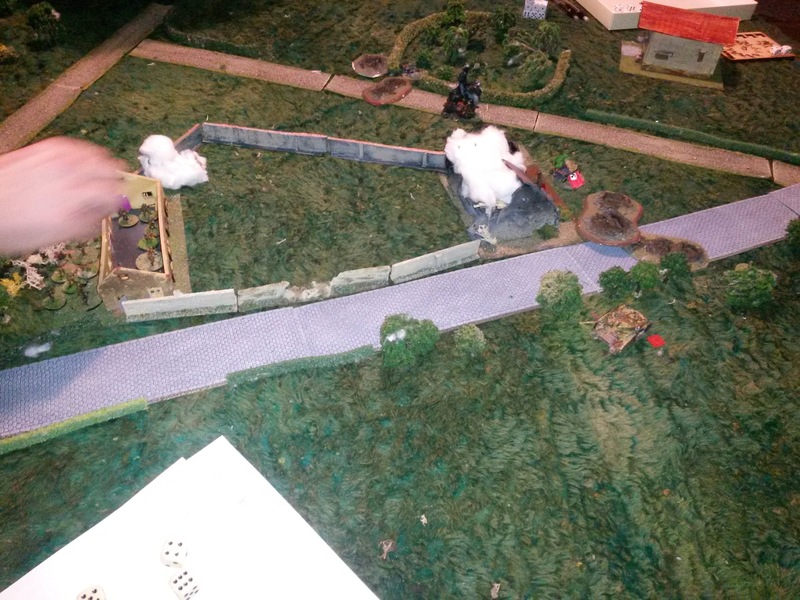 Dashing paratroopers, an evil nazi officer wearing leather overcoat, halftracks with panzer grenadiers, some bocage like terrain (Yes, strictly speaking it should not be bocage) and a tiger, at least. 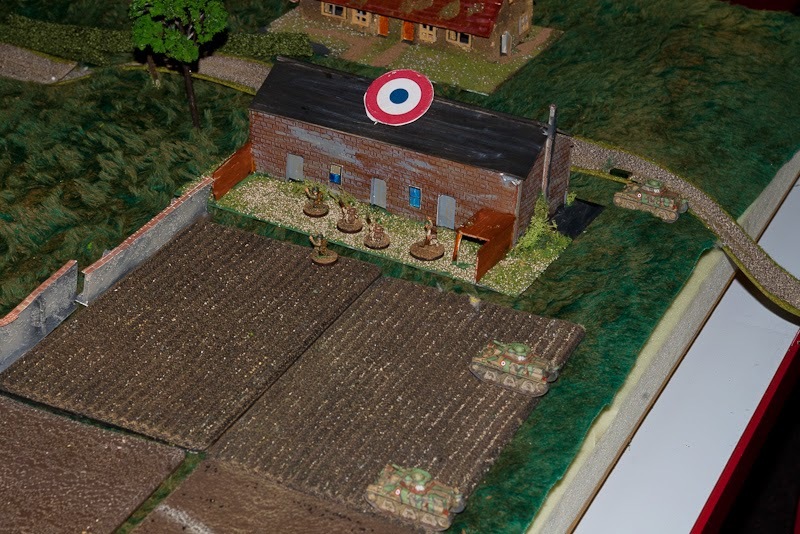 Defenders would consist of a reinforced platoon of British airborne troops, dug in the le Bas de Ranville. 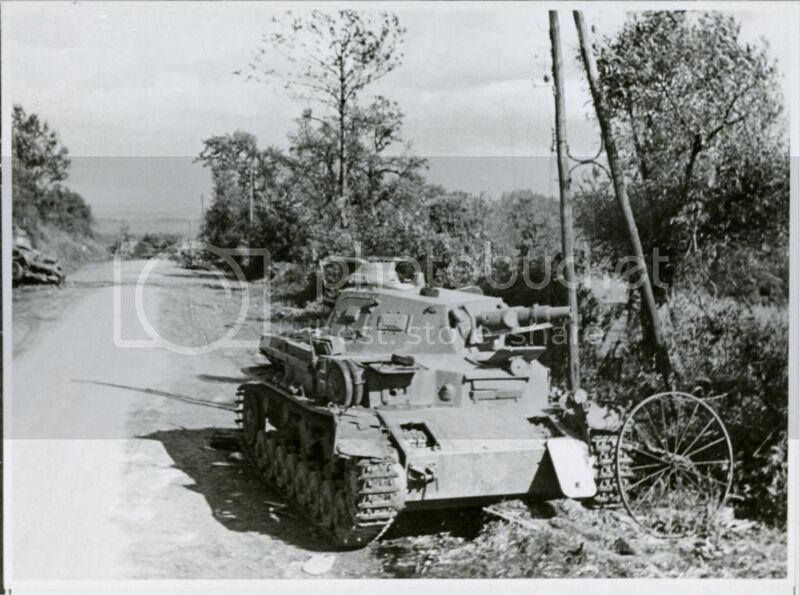 Attackers were part of KG von Luck, partially mechanized PG platoon supported by a PzIV (as I was lacking suitable converted French models), presented by a Tiger as long as it was out of LOS from the defenders. From my experience, main stumbling block of CoC is understanding the organization of your force: who commands what, where are teams and sections. (And how you translate those to Finnish: we settled to joukkue, ryhmä and partio.) We created a visual roster with the hierarchy shown to make it easier to understand. 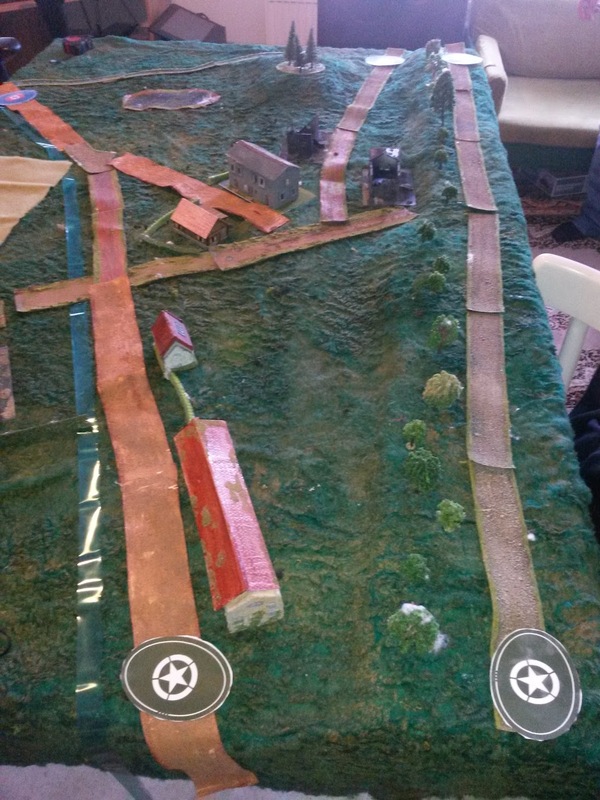 Players were also shown the historical maps and how the scenario was created, to give a bit more background. A couple of test games were played, first was to see if the scenario (modified from KG von Luck) worked at all - map underwent several changes, but a good game was had. And in the second game we worked on the details and balancing. As for Ropecon itself, we were planning on either 2 or 3 games, depending on the participants. 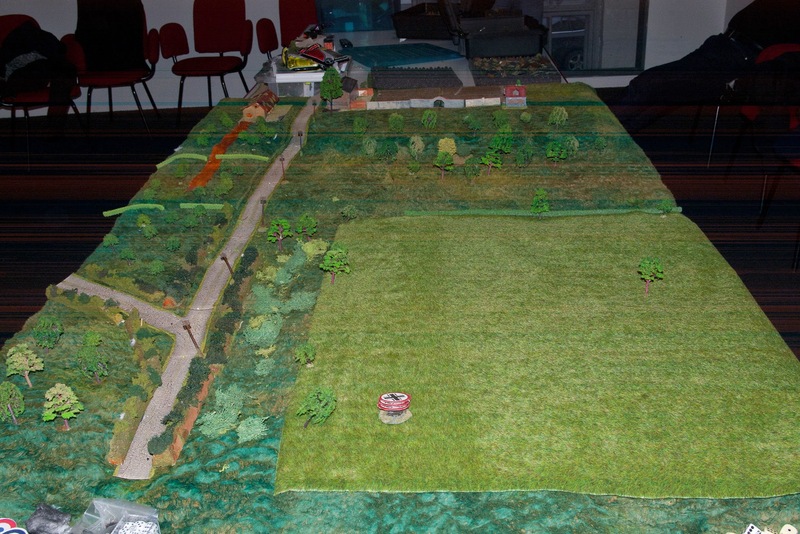 We had only a moment to set up the table and game before first volunteers appeared - both experienced gamers with no experience whatsoever about miniature war-games and mostly cursory understanding of ww2. But they quickly rose to the challenge and we had one of the most cinematic CoC games ever - the last survivors of the last British section charged over open ground to take out the PzIV, lost several men and the last standing NCO then brewed up the tank, forcing German morale to 0. In all games, we first started by asking players what they would like to do and then showed how the available command dice could be used for that. In both games, players did not need much help in basic activations/shooting after 30mins or so. Things like morale rolls, CoC die, hitting tanks etc were introduced when they happened. "This is using surprisingly elegant mechanics. Although designer clearly loves his bucket of dice." "I finally understand why reduced number of NCOs hurt Germans. And how the extra lmg influences tactics." "War gaming is much more fun than I thought." From the sidelines were had a French expat commenting that she had no idea what we were doing, but it was clearly happening in France. And a little girl offering part of her treasured berry flavored liquorice as a thank you for taking time to explain ww2 and miniature gaming in general. And one concerned citizen correcting a silly mistake I was making with the shock rules. So much for CoC being overtly complicated. Gandi blogs seem to be suffering badly of spam comments as of late, almost as if the spam filters were not applied at all. So comments disabled for now, sorry. Last couple of months have been very busy with work and preparations for Ropecon We got a table at Kokemuspiste (Point of Experience, a place to try out new games and low barrier intro to gaming.) and ran Chain of Command for one day for anyone interested. 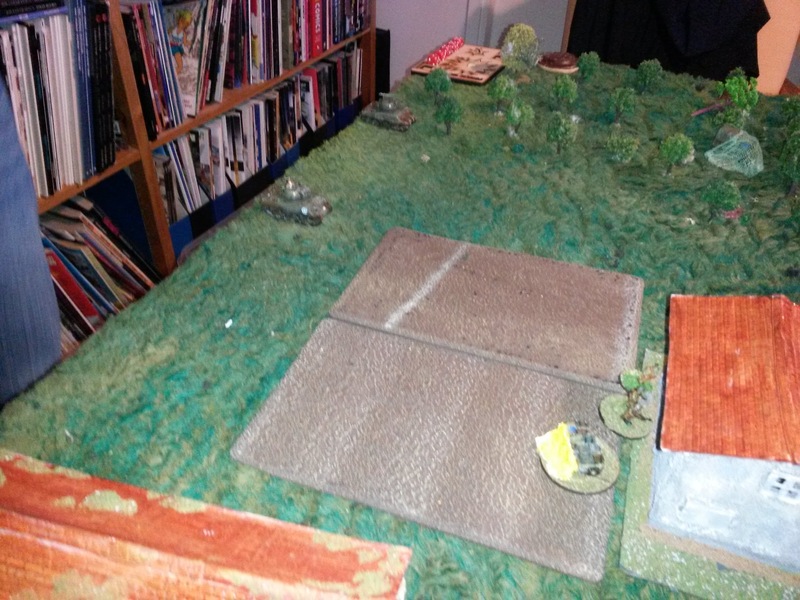 Slightly modified 2nd scenario of Kampfgruppe von Luck. I wanted Germans to have at least one tank capable of going toe to toe against PIATs, so added a StuG. Week before the game I noticed that the StuG battery of 21st was of course made up by modified French assault guns. Those were not available within the timeframe, so a PzIV was added - maybe not present in the first morning of the assault, but at least part of 21st's TOE. Ho-hum. And a Tiger was added just for atmosphere - as long allies did not actually see the PzIV, it used a Tiger model. Poster by Heikki, who also co-GM'd the day with me. 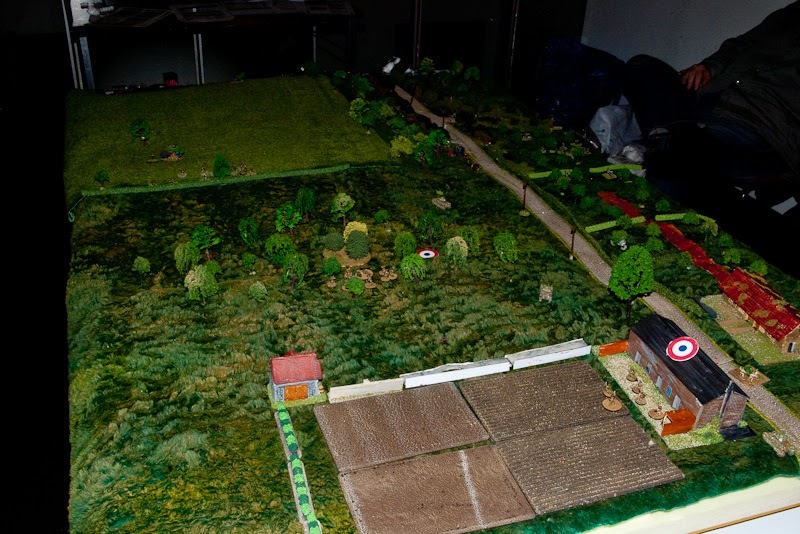 Most players were completely new to miniature gaming with knowledge of ww2 varying from "none" to "alot". Both gamemasters talked enough to lose their voice and players seemed to enjoy the experience, so a good day all in all. Pictures to follow at some point. Last of the French Panhards is abandoned, German Panzers are free to roam the woods. But not before forcing one PzIII to bail due to shock of incoming fire. The French defenses in the woods of Mont Dieu have collapsed along the Stonne road, even if most of their infantry is stubbornly defending rest of the area. The forward elements of the German attack have reached the Stonne uplands in the early morning hours. The Pain de Sucre dominates the area, but for some reason the approaching Germans have not been shelled during the march. The Stonne area is a veritable fortress with heavily forested steep hillsides and sunken roads leading to the village. French defenders have apparently been surprised by German rapid advance, as civilians are seen scurrying back inside, as first German patrols enter the village proper. 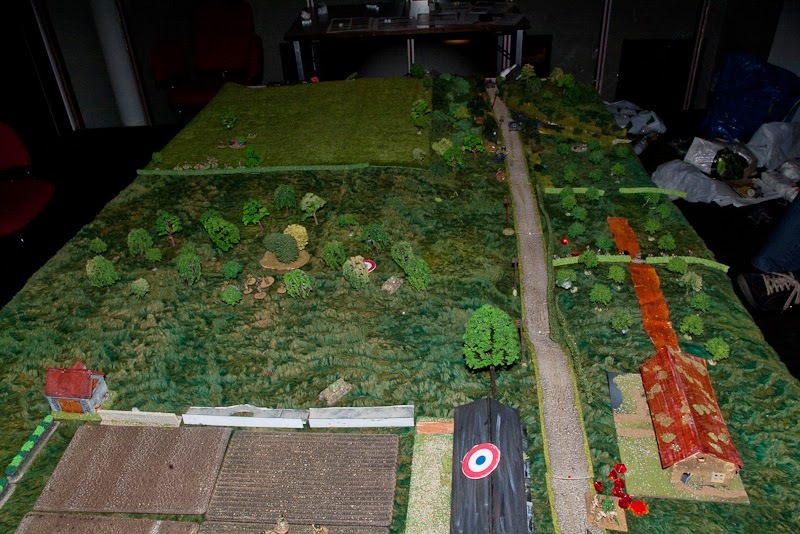 Just a small strech of road to go..
"Fight through the woods was surprisingly easy, it looked like the French were not expecting tanks and their morale collapsed. Many positions were found unmanned or defenders withdrew after a short fight. Now the price is almost within reach, as soon as Stonne highlands are secured, southern flank is secure. Men and machines are weary, gunners and radio operators are driving tanks so that commanders and drivers get a bit of sleep, some crossroads were not marked as scouts were so tired that they missed them, and the whole logistic chain is operating under huge stress. But now that the Pain de Sucre is visible behind the morning mist, everyone has woken up. One final push! Yesterday Luftwaffe reported that heavy enemy armoured formations were identified in the area. It is unlikely that they are already in position seeing how surprised the enemy is, but be prepared for a counter attack. Morning mist has just lifted in Germany, so first Stukas will be here in an hour to support the attack, if needed. The pioneers are cleaning Pain de Sucre, so a forward observation post can be set up, artillery support will be available in half an hour by the battalion mortars. It looks like the French were completely surprised, as civilians are scurrying to cover and soldiers are running back and forth, a non-deployed daisy chain mine field resting by the roadside. Push your men forward to capture a foothold at the village and secure the crossroads so that the following platoon can deploy via the southern road, too. " 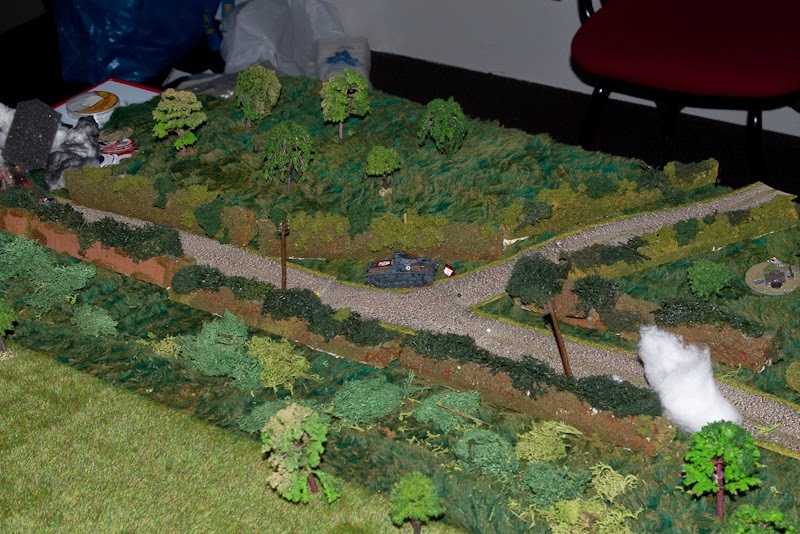 German tanks were restricted to the road (sunken with steep sided and ditch by the road, so in game road was only 1 tank wide.) while the infantry was able to attack along the whole front. The French defense had finally awoken, and stopped German patrols before they could push too far forward. Germans had 2 options, to attack directly from the marching order or to wait for the supporting medium mortars to set up. They decided to attack immediately, giving the defenders no time to make plans. Location of patrol markers and Jump-off points. German attacking from the top. View from the German edge. And view along the road. Obergefreiter Thalberg led the 1st section through the orchard at the left flank, only to be stopped by the first French section - this was to develop into an epic firefight and orchard would run red before long. 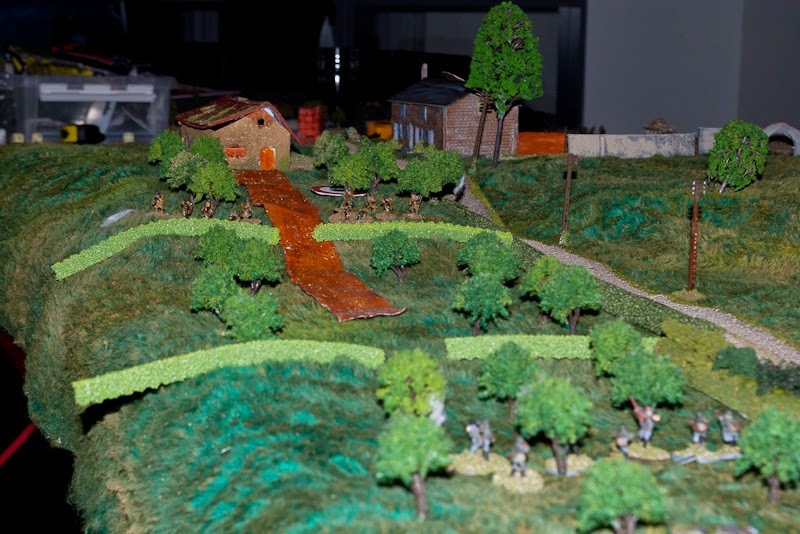 Meanwhile the second section under Wulf dashed forwards from the small depression in the fields - French rifle grenadiers took them immediately under fire, while Wulf started pouring fire at the French section in the orchard. Few meters of the orchard would see almost 30 men dead or dying. The Germans knew that the beginning of the road was a bad place to be, but they only understood how bad, when the first shot from H39 penetrated the front hull of the leading PzIII, killing the driver. First shot, and the road was blocked. A quick smoke shell mitigated the disaster, but the poor PzIII was knocked out as it tried to dash forwards. The following PzJgI self-propelled anti-tank gun crept forward under the cover of smoke, while the German panzer commander tried to figure out what to do. First one got this far. Meanwhile in the orchard, heavier fire from 2 German sections (plus very annoying 50mm mortar) started to tell. The first French section was killed and the second one was committed to slow the Germans, only to suffer grievous casualties, too. German tanks at this point could do nothing, but they kept the H39s occupied, so full wrath of the tiny tanks was not unleashed at the leading German section, which probably saved the attack. 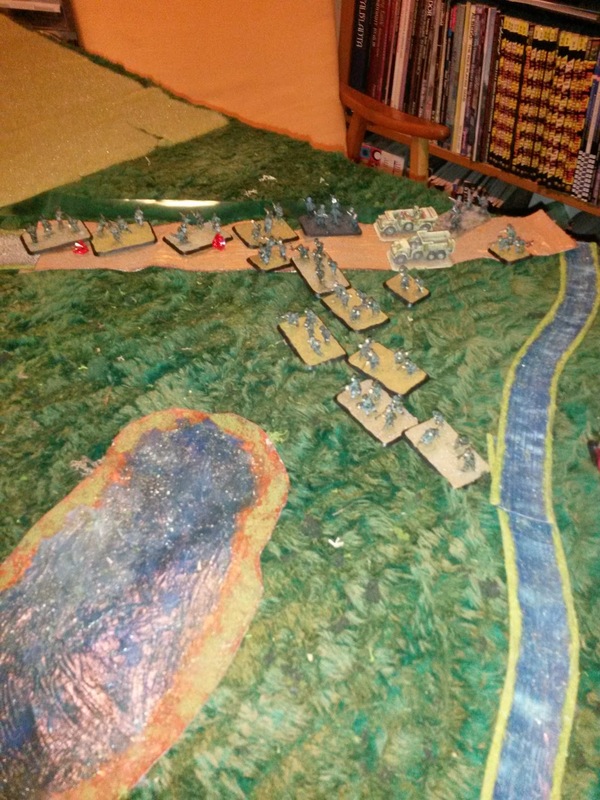 French defended a commanding position, but unfortunately it was open for flanking fire. The whole German right flank was pouring fire at the poor French section, while enemy was keeping it in place with frontal presence. Fights like these cannot be win and probably should not be reinforced. Hindsight is always perfect. German supporting sections. Forward one has lost several men to the incessant rain of rifle grenades. 2nd French section and accompanying platoon sergeant run. 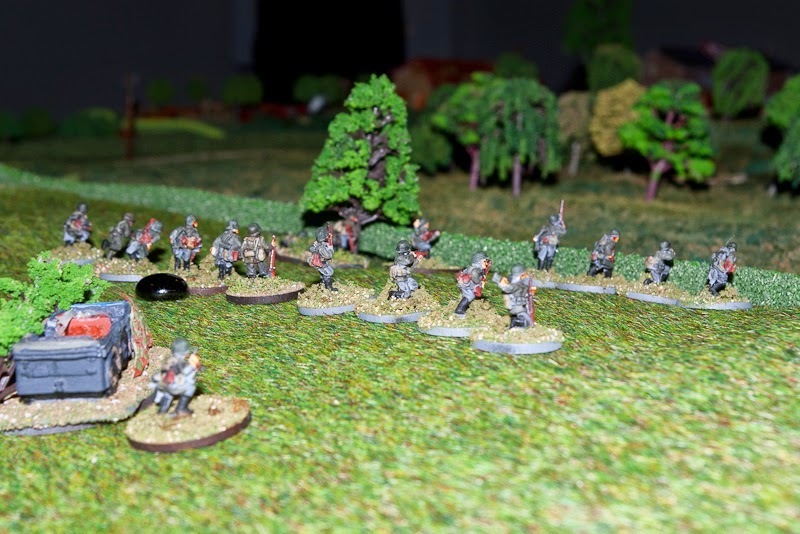 Almost a break-through, hastily deployed 25mm gun and H39s keep the German infantry at bay. Usually, traffic near Stonne is not this bad during the morning hours. Black chaps mark crews abandoning their tanks. The remaining 2 French tanks started to withdraw, as it was clear that they could inflict severe casualties to the attackers, but would be cut off as a result. A bloody victory for the Germans. German CO is very happy with his favorite panzer commander while infantry earns a pat on the shoulder. The men of the German platoons are not happy with the casualties, but are holding together. 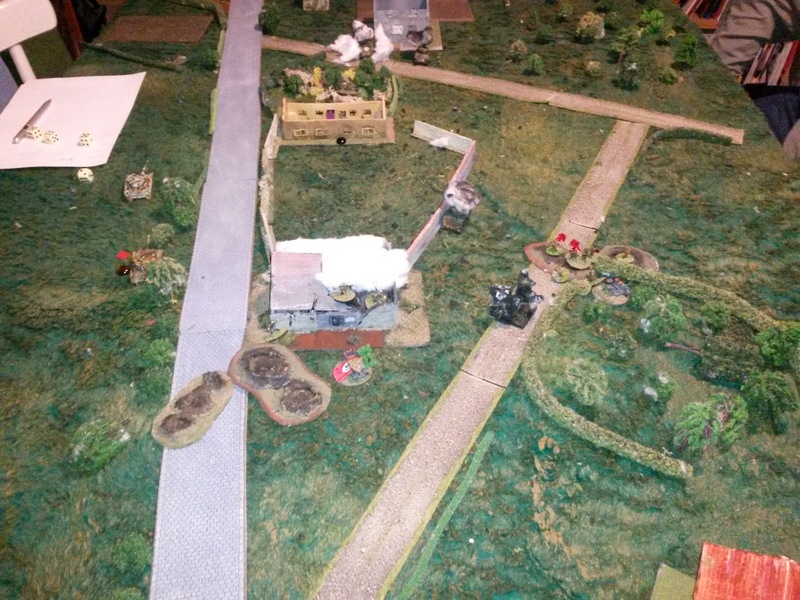 French commander is unhappy with his platoon leaders, saying that they withdrew too easily. Men of the tank platoon are very happy with their leader, while the morale of the remaining infantry is plummeting. Final tally of morale and CoC pips. The hero of the game, H39 platoon leader. This was a very close run game, probably decided by the fact that the French decided to make a stand in a place where they could be seen by the flanking German sections - had the second section deployed slightly later, the flanking German fire would have been mostly prevented by the French armour. Of course, their JOP was wide open for an attack at that point, so it would have been a gamble. French were also hampered by the fact, that they were not allowed to coordinate before the game, while Germans were allowed to have a private talk at any point. The French infantry was fighting a delaying action, while their armour was making a counter attack towards Pain de Sucre. German discussions were mainly about abandoning the attack and comments about the true dash shown by panzers - at no point there were ahead of the poor infantry. 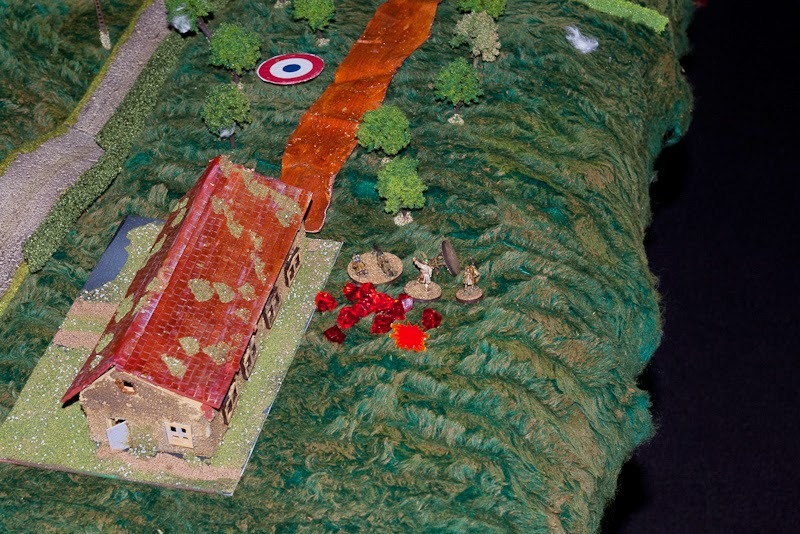 The village was defended by 25mm at-guns, some infantry and Panhard armoured cars. 25mm gun knocked out several Germans tanks (PzIV etc) and was forced to withdraw when supporting infantry was not there. Panhards knocked out PzIIs, but the damage was done and the French withdrew. A couple of uncoordinated counter attacks followed, all pushing the Germans back and then failing as support was not there. In the game Germans had PzIII instead of PzIIs, so I also upped the defenders to H39 instead of Panhards. The historical setup would probably play as well, I have no idea why I originally went for PzIII. Road leading to the village.